In 1911 and 1912, an Austrian physicist named Victor Hess took to the sky in a series of risky hot air balloon trips—for science. Down on land, researchers had been registering signals of mysterious energetic particles on their instruments. They didn’t know what the signals were or where they came from. So in progressively thinning air, more than three miles off the ground, Hess performed experiments to figure out if the particles came from above or below. His conclusion: The particles came from space. Hess had discovered cosmic rays—extremely energetic protons and atomic nuclei that travel from the far reaches of the universe to bombard every patch of the Earth, every second of every day. But then, the research stalled. Sure, Hess figured out that the high energy particles came from space, but, like, space is huge. Where in space? Cosmic rays are extremely energetic—often crashing into the atmosphere with thousands of times more energy than the particles at the Large Hadron Collider. The extraterrestrial shrapnel would have to be produced in cosmic car crashes of epic proportions—but it’s hard to interpret the forensics because the rays bend and deflect on their way to Earth. Scientists still can’t account for all the cosmic rays that come here, especially the most energetic particles. Since Hess’s discovery, they have only found a couple astronomical objects within the Milky Way that produce lower-energy cosmic rays. Now, more than a century after Hess’s discovery, scientists have finally located a source of the most energetic rays. Starting with a single signal—a flash of light in a detector at the South Pole—and combining it with telescope data from a collaboration of over a thousand people, astrophysicists have traced the origin of some of Earth’s cosmic rays to a blazar, a type of galaxy, 4 billion light years away. “We’ve learned that these active galaxies are responsible for accelerating particles and cosmic rays,” says physicist Francis Halzen of the University of Wisconsin-Madison. They reached this conclusion after some 10 months of detective work—and it was only possible because they had access to a smorgasbord of signals from many instruments: not just visible and X-ray light from telescopes, but also signatures of extremely light particles flying through space called neutrinos. If telescopes are our eyes on the cosmos, neutrino detectors might be our ears, or nose: Their signals reveal complementary information. This new method of observing is known as multi-messenger astronomy. A neutrino detector was key to solving this case. Neutrinos form when high energy protons and atomic nuclei whizz around and smash into each other, which is why they accompany cosmic rays. 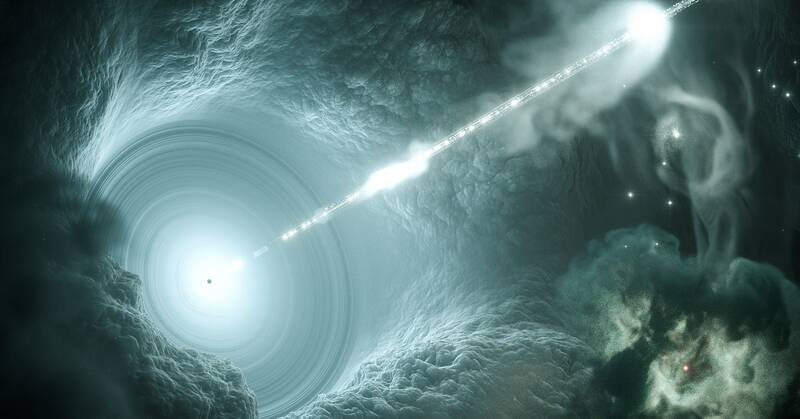 If you can figure out where a high-energy neutrino came from, you can bet that cosmic rays came from the same place. And the nice thing about neutrinos is that they don’t interact much with anything. They tend to fly right through solid objects and don’t interact with light or magnetic fields. “Neutrinos basically take a straight path from where they form to where we detect them,” says physicist Darren Grant of the University of Alberta. If a detector can discern the direction that a neutrino is traveling, you can trace its trajectory to the point it was born—along with a cradle of cosmic rays. The IceCube neutrino observatory consists of over 5,000 of these detectors, embedded a mile under Antarctic ice, for catching neutrinos. As usual, the other astronomers tried to see if they could figure out where the signal came from. But unlike prior attempts, this time, they found a compelling candidate in the patch of sky where the neutrino originated. Six days after the observation, astrophysicist Yasuyuki Tanaka from Hiroshima University in Japan identified a galaxy in the constellation Orion, centered around a violent black hole that whips particles out at high energy. He suggested they study it further. It belonged to a class of galaxies known as blazars, discovered several decades ago. The objects are ostensibly named because they “blaze”—they emit radiation that pulses in time—and are a type of quasar, a type of galaxy that emits radio waves. “It was a joke originally, but it stuck,” says astrophysicist Felicia Krauss of the University of Amsterdam, who contributed to the work. “It’s a great word.” Krauss’s collaboration, which operates the space telescope Fermi-LAT, has catalogued more than a thousand blazars. The community had known about this galaxy for a while, but they hadn’t thought much of it because it wasn’t particularly active compared to other blazars. “It was considered too boring,” says Krauss. But when they looked again this time, their telescopes revealed a much more exciting scene. The blazar was emitting high-energy photons known as gamma rays, which are also associated with neutrinos and cosmic rays. And when they combed through archived neutrino data, they found a dozen neutrino signals from that area in the sky in 2014 and 2015. Combined with the neutrino signal, the physicists say they’re pretty convinced that this blazar produces high energy neutrinos and cosmic rays. In their statistical analysis, they calculated the likelihood that the concurrent gamma ray and neutrino activity are unrelated is about 0.1 percent. “It’s strong evidence,” says physicist Mayly Sanchez of Iowa State University, who was not involved in the work. But physicists set a high bar for announcing anything for sure: They need several thousand times more statistical certainty to say definitively that this blazar produces neutrinos and cosmic rays. To achieve that, they’ll have to catch more neutrinos from that direction, she says. In addition, while they’re pretty sure this blazar produces cosmic rays, they don’t know what other objects might make them too. Halzen says they plan to look for those by trying to detect neutrinos from other parts of the sky. And they still don’t know why, of all places, they found this particular galaxy. Researchers don’t understand in detail how blazars behave, and prior to this work, they’d thought that they didn’t produce a lot of neutrinos. “There is something special about this blazar,” says Halzen. “We don’t know what it is.” Whatever it is, it will certainly set the field alight. Next PostNext The best VR headset 2018: which headset offers the best bang for your buck?